I’m impressed with how opaque this lip cream goes on. It feels lightweight but looks a bit too thick and goopy for me. The shade is flattering for my light skin tone and I think it would be beautiful on darker skin tones too. The formula has a light minty scent and wears well but isn’t transfer proof. I’ve tried this brand of sheet masks many times before and they are a great staple to keep around for recharging dry skin. All of the masks are free of many irritating ingredients like fragrance, sulfate, and paraben and they are biodegradable. These two versions are good for combating the signs of aging and prepping your skin for a big night out. My skin always feels plump and hydrated after using these. Tip: I store them in the fridge for extra soothing action. The entire collection of blushes from Bang Beauty are quite punchy. This shade has a bright apricot base with a subtle golden shimmer. 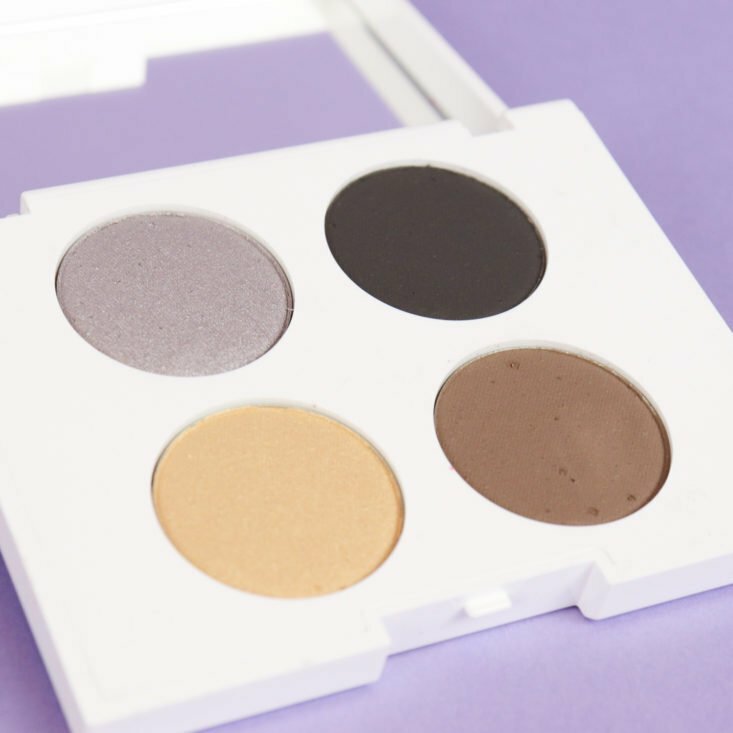 The powder is soft and pigmented which means you only need a little bit to bring a flush to your cheeks. Once I buffed it on, it lasted until I removed my makeup and felt comfortable all day. At first, I wasn’t very excited about this palette; it just looks kind of boring. But, after using it, I think it’s pretty good. The compact is bulky but includes a nice size mirror for on-the-go looks. The metallic silver and gold shades are sooo buttery and smooth. The matte brown and black are soft too but more patchy when swatched. Once applied to my lids, I don’t notice any patchiness and think they blend well. The black is the perfect tight lining shade and the metallics are beautiful when patted on with a fingertip. Here’s a look using the lip color, blush, and eyeshadow palette. For the eye look, I used a base shade from another palette then worked the brown into my crease and blended it toward the center of my lid. Then I mixed some of the gold and silver on my fingertip and pressed them onto the inner corner of my lid, blending outward. Lastly, I took a small angled brush and tight lined my lashes with the black for a full, defined look. I just smudged some of the leftover color onto my lower lashline. This is the product I’m missing. I’m going to count it toward the total value since I’m assuming all other subscribers received it. I reached out to Customer Service and awaiting a response. The Verdict: My Lola Beauty Box this month was just ok. Unfortunately, I was missing a product but I’m hoping that was just a fluke for my box. I didn’t love the lip color but the masks are always a good staple and the blush and eyeshadow outperformed my expectations. This month, everything was full-sized and the total retail value is $100 (including the value of the missing product). That’s good for a cost of $21 and free shipping. Can you still get this box if you sign up today? If you sign up today, your first box will be the November box (until it is sold out, then you’ll receive December’s box). My October box was not only late but both the eye shadow & blush were in pieces. This could have been avoided by better packaging. The box was full of paper squiggles but everything was on top of them! I contacted them & sent photos twice but they didn’t get back to me on a replacement. Had to get a refund from my bank. This box started off well but has definitely gone downhill between the debacle with so many broken items in October & a very rude customer service response was posted in many of the facebook beauty groups. I’ve cancelled & not looked back. I received this box and when I opened it I discovered my blush had broken and covered everything. I contacted their customer service right away and the requested pictures of the broken blush which I did. Then I never heard back from them and never received a replacement. Was very disappointed. I received my replacement blush this month with my november box! Hi Aileen! Thanks for reading! I’m sorry you had to deal with a broken product too. Like Casp said, I think they typically handle situations like this by sending a replacement in the next month’s box. I would just keep reaching out until they get back to you, hopefully soon.